It is considered that pruritus might be either a predisposing factor of development of cutaneous lichen amyloidosis or its symptom. In this case report we try to elucidate this issue. 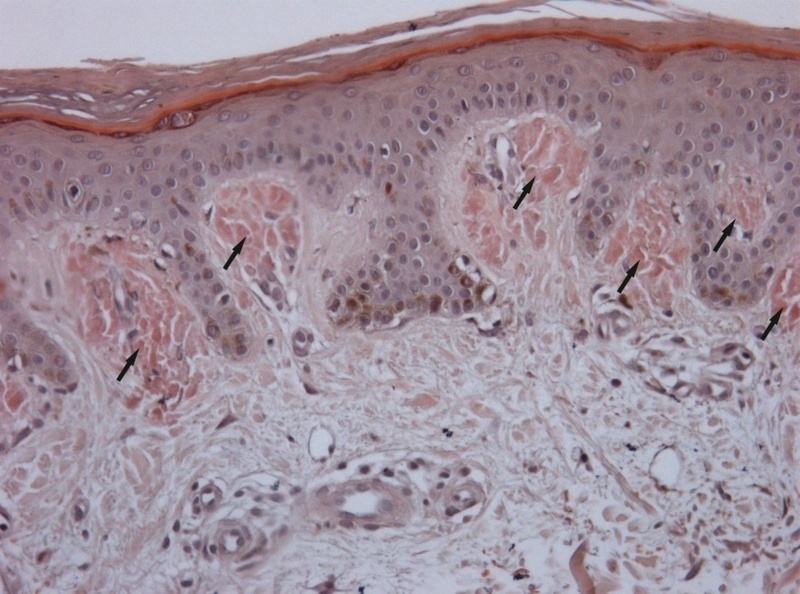 Case of 27-years old patient of Asian origin with cutaneous lichen amyloidosis is presented. Sites of lesions closely matched the scratched areas. Within the affected area there was a melanocytic nevus, which the patient avoided to touch. The area around the nevus was free from amyloidosis lesions. It proves the role of pruritus followed by scratching in the development of cutaneous lichen amyloidosis patches. Kubanov AA, Karamova AE, Chikin VV, Znamenskaya LF, Kondrashova VV, Nefedova MA. Cutaneous lichen amyloidosis within scratched areas. Russian Open Medical Journal 2018; 7: e0205. Cutaneous lichen amyloidosis is a subtype of primary localized cutaneous amyloidosis, developed as the result of amyloid masses deposition in dermal papilla. The etiology of the disease is unknown. The disease onset may be preceded by chronic skin irritation through scratching, scrubbing oneself by nylon brushes, towels or bath sponges, and applying of skin scrubs regularly for many years [1, 2]. Genetic predisposition to cutaneous amyloidosis is supposed. The pathological process usually affects exclusively skin, involvement of internal organs is not characteristic . Cutaneous lichen amyloidosis lesions most typically presented on the legs, ankles, dorsum of feet and on the hips as clustered yellowish-brown or reddish-brown papules that may coalesce to form hyperkeratotic patches, which may resemble lichen planus, lichen simplex or nodular prurigo . Lesions may be evident on the external ears as small clustered papules and also in sacral and perianal areas. Patients with cutaneous lichenoid amyloidosis may have lesions typical for macular variant of the disease, therefore the lichenoid and macular subtypes of amyloidosis are deemed to have common etiology . Pruritus is a common feature of cutaneous lichenoid amyloidosis. Its intensity can be strong enough to reduce the quality of patients’ lives. It is suggested that itching is due to peripheral neuropathy affected thin cutaneous nerve fibres resulted in reduction of their number in epidermis and dermo-epidermal junction in lesion areas and therefore in elevation of their irritability . Activity of peripheral neuropathy correlates to the pruritus intensity experienced by the patient . It is assumed that the development of lichenoid amyloidosis lesions is due to pruritus. Scratching and scrubbing of the skin lead to the damage and apoptosis of keratinocytes, so their proteins are deposited in dermal papillae as the base for amyloid mass formation . Nevertheless, there are patients with cutaneous lichen amyloidosis lacking pruritus. Thus, it has been suggested that itching is not the etiological factor, but just one of the symptoms of lichenoid amyloidosis . Clinical case described below should demonstrate the role of itching in the development of cutaneous lichen amyloidosis lesions. State Research Center of Dermatovenereology and Cosmetology was visited by 27-years old man of Asian origin arrived from the Republic of Kazakhstan. Onset of the disease was at the age of 10, when the patient began to scratch the skin on the legs and later noticed the nodular lesions at the same areas. Thereafter pruritus expanded widely, lesions appeared on the dorsum of the feet, on the hips, scrotum and forearms. During the examination yellowish- and reddish-brown papules coalesced into the plaques were found on the dorsum of the feet, on the hips, scrotum and forearms, also lichenization and hyperpigmentation of scrotal skin were noticed. Lesions were severely itchy and their sites were closely matched to the scratched areas. There was melanocytic nevus on the anterior surface of the hip, which the patient avoided to scratch, so the area directly around the nevus was free from lesions, surrounded over a distance by lichenoid papules (Figures 1 and 2). Histopathological examination of biopsy sample from the lesion on the hip revealed mild acanthosis, moderate hyperkeratosis, and hyperpigmentation of basal keratinocytes. In the papillary dermis there were scant perivascular lymphohistiocytic infiltrates. Amorphous eosinophilic deposites were clearly seen in dermal papillae. With Congo red staining the deposites became brick-red colored, estimated as positive reaction for amyloid (Figure 3). The identified histopathological signs corresponded with the diagnosis of cutaneous lichenoid amyloidosis. Patient was treated topically by 0.1% tacrolimus ointment applied directly on lesions 2 times per day. In 1 month of therapy patient noted subtle reduction of pruritus intensity. Figure 1. Cutaneous lichenoid amyloidosis with papules coalesced into plaques on legs and hips (A–D). Note the absence of lichenoid lesions on the non-scratched skin area (around melanocytic nevus on the anterior surface of the hip) (A, D). Figure 2. Cutaneous lichenoid amyloidosis with papules coalesce into plaques on forearms (A); presence of lichenoid lesions on the scrotum (B). Figure 3. A) Light-eosinophilic deposites in dermal papillae (х200, hematoxylin and eosin staining). B) Clearly seen brick-red colored deposites of amyloid (х200, Congo red staining). The described patient had lesions localized on the skin of extremities and other features typical for cutaneous lichenoid amyloidosis. The same skin lesions as localized on patient’s scrotum could be found in lichen simplex chronicus. At the same time localized cutaneous amyloidosis lesions may mimic lichen simplex chronicus . The diagnosis of cutaneous amyloidosis was confirmed by detection of amyloid deposits in the papillary dermis by histopathological study. Formation of amyloid deposites is considered to be associated with degenerative and apoptotic processes in basal keratinocytes following the continuous scrubbing and scratching of the skin due to the pruritus. Apoptotic process leads to formation of fibrillar masses, containing cytokeratins, galectin-7 and F-actin, finally transformed to amyloid [6, 8]. 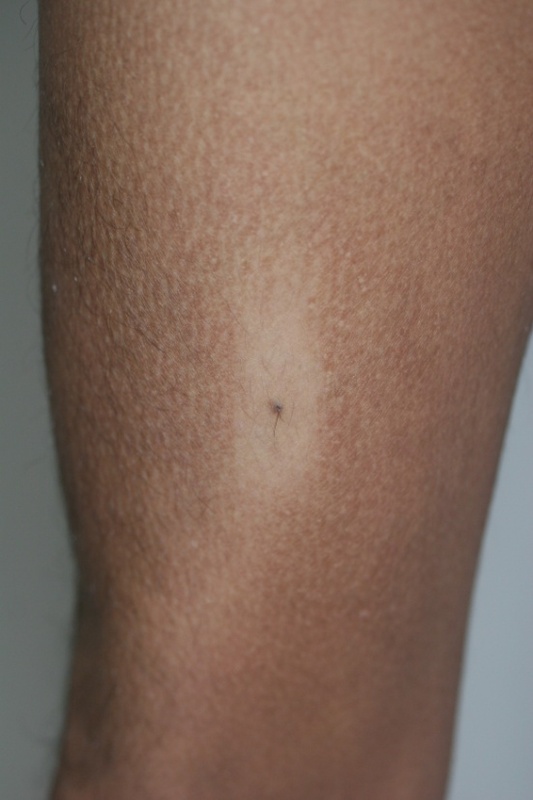 However pruritus is not the essential sign of the disease, observed in 60–90% of primary localized cutaneous amyloidosis cases. This fact was the reason for doubts in importance of itching for the development of cutaneous lichenoid amyloidosis lesions [5, 7]. However, absence of lesions of cutaneous lichenoid amyloidosis around the nevus of the described patient, who was afraid to scratch that area, is indicative for the importance of sratching and scrubbing in the development of lesions. There are different methods described to be used for treatment of patients with cutaneous amyloidosis. For some patients the effectiveness of systemic therapy by acitretin, cyclosporine, acyclovir and interferone-alpha and pulse therapy by dexamethasone-cyclophosphamide was shown. In some cases therapeutic benefit was reached by the use of physiotherapy, including phototherapy (selective phototherapy, narrow-band middle wave phototherapy, PUVA-bathes with oral administration of acitretin, Nd:YAG laser, pulse-dye laser). Sometimes the effectiveness of topical glucocorticosteroid drugs, calcipotriol, dimethylsulfoxide, hydrocolloid dressings was noticed . It is considered that neuropathic pruritus driven by pathologic changes of peripheral nerves can be effectively reduced by tacrolimus . It was shown that itch experienced by patient with lichenoid amyloidosis decreased in 2 weeks of 0.1% tacrolimus ointment applications, and in 2 monthes the significant reduction of the thickness of patches was noted . However, for our patient the topical therapy with 0.1% tacrolimus ointment was not enough to achieve the significant improvement. Only subtle reduction of itch strength was noticed by patient in 1 month of the therapy. Therefore, in the described case the characteristic localization of lesions which matched the scratched areas points out the important role of pruritus and associated scratching and scrubbing of the skin in the development of cutaneous amyloidosis lesions. Reporting of new cases and further explorations may lead to new findings in the pathogenesis of lichenoid amyloidosis. Here we demonstrate the fact that the reduction of pruritus intensity and associated scratching and scrubbing of the skin can prevent the development of lesions of cutaneous lichenoid amyloidosis. Therefore, effective reduction of pruritus is an important concept in the treatment of cutaneous lichenoid amyloidosis. Weyers W, Weyers I, Bonczkowitz M, Diaz-Cascajo C, Schill WB. Lichen amyloidosus. A consequence of scratching. J Am Acad Dermatol 1997; 37 (6): 923–928. https://doi.org/10.1016/S0190-9622(97)70066-5. Venkataram MN, Bhushnurmath SR, Muirhead DE, Al-Suwaid AR. Frictional amyloidosis: a study of 10 cases. Australas J Dermatol 2001; 42 (3): 176–179. https://doi.org/10.1046/j.1440-0960.2001.00514.x. Kaltoft B, Schmidt G, Lauritzen AF, Gimsing P. Primary localised cutaneous amyloidosis – a systematic review. Dan Med J 2013; 60 (11): A4727. https://www.ncbi.nlm.nih.gov/pubmed/24192243. Tanaka A, Arita K, Lai-Cheong JE, Palisson F, Hide M, McGrath JA. New insight into mechanisms of pruritus from molecular studies on famalial primary localized cutaneous amyloidosis. Br J Dermatol 2009; 161 (6): 1217–1224. https://dx.doi.org/10.1111/j.1365-2133.2009.09311.x. Tey HL, Cao T, Nattkemper L, Tan VW, Pramono ZA, Yosipovitch G. Pathophysiology of pruritus in primary localized cutaneous amyloidosis. Br J Dermatol 2016; 174 (6): 1345–1350. https://dx.doi.org/10.1111/bjd.14391. Miura Y, Harumiya S, Ono K, Fujimoto E, Akiyama M, Fujii N. et al. Galectin-7 and actin are components of amyloid deposit of localized cutaneous amyloidosis. Exp Dermatol 2013; 22 (1): 36–40. https://dx.doi.org/10.1111/exd.12065. Ramirez-Santos A, Labandeira J, Monteagudo B, Toribio J. Lichen amyloidosis without itching indicates that it is not secondary to chronic scratching. Acta Derm Venereol (Stockh) 2006; 86(6): 561–562. https://dx.doi.org/10.2340/00015555-0155. Chang YT, Wong CK, Chow KC, Tsai CH. Apoptosis in primary cutaneous amyloidosis. Br J Dermatol 1999; 140(2): 210–215. https://doi.org/10.1111/j.1365-2133.1999.02651.x. Şavk E. Neurologic itch management. Curr Probl Dermatol 2016; 50: 116–123. https://dx.doi.org/10.1159/000446053. Castanedo-Cazares JP, Lepe V, Moncada B Lichen amyloidosis improved by 0.1% topical tacrolimus. Dermatology 2002; 205(4): 420–421. https://dx.doi.org/10.1159/000066426. Alexey A. Kubanov – MD, PhD, Lead Researcher, Department of Dermatology, State Research Center of Dermatovenereology and Cosmetology, Moscow, Russia. http://orcid.org/0000-0002-7625-0503. Arfenya E. Karamova – MD, PhD, Head of Department of Dermatology, State Research Center of Dermatovenereology and Cosmetology, Moscow, Russia. http://orcid.org/0000-0003-3805-8489. Vadim V. Chikin – MD, PhD, Lead Researcher, Department of Dermatology, State Research Center of Dermatovenereology and Cosmetology, Moscow, Russia. http://orcid.org/0000-0002-9688-2727. Lyudmila F. Znamenskaya – MD, PhD, Lead Researcher, Department of Dermatology, State Research Center of Dermatovenereology and Cosmetology, Moscow, Russia. http://orcid.org/0000-0002-2553-0484. Victoriia V. Kondrashova – MD, Dermatologist, Department of Clinical Dermatology, State Research Center of Dermatovenereology and Cosmetology, Moscow, Russia. http://orcid.org/0000-0003-4335-387X. Maria A. Nefedova – MD, Junior Researcher, Department of Dermatology, State Research Center of Dermatovenereology and Cosmetology, Moscow, Russia. http://orcid.org/0000-0003-1141-9352. © 2017, Kubanov A.A., Karamova A.E., Chikin V.V., Znamenskaya L.F., Kondrashova V.V., Nefedova M.A. Correspondence to Arfenya E. Karamova. Address: State Research Center of Dermatovenereology and Cosmetology, Korolenko str., 3, bldg 6, Moscow, 107076, Russia. Tel: +7(499) 785-20-40. Fax: +7 (499) 785-20-16. E-mail: karamova@cnikvi.ru. Chikin, Vadim V. - Karamova, Arfenya E. - Kondrashova, Victoriia V. - Kubanov, Alexey A. - Nefedova, Maria A. - Znamenskaya, Lyudmila F.